Payroll Software from ZPAY Payroll Systems, Inc. Try PayWindow Payroll for FREE! Affordable And Easy To Use Software From ZPAY Payroll Systems, Inc. Does processing your payroll take too long? PayWindow 2019 Has Been Released! Try PayWindow Payroll System for FREE! Looking for a new Payroll System? Download and try PayWindow today! PayWindow can be downloaded for a FREE 30 day trial! So try our award winning software for 30 days for FREE and purchase only after you've seen for yourself how easy payroll processing can be with PayWindow. You will be ready to start your paying your employees immediately with this easy to use software. So stop doing payroll by hand or replace your expensive solutions with our affordable easy to use software! PayWindow software runs on Windows Vista, Windows 7, Windows 8 and Windows 10. 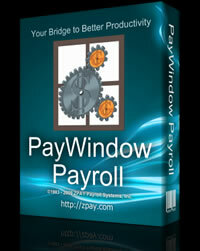 Turn hours of payroll processing into minutes with this easy to use PayWindow software package! From ZPAY Payroll Systems, Inc. Affordable And Easy To Use Payroll Software! PayWindow Award Winning Payroll Software. Performing your own payroll is fast and easy with the PayWindow payroll software. With our FREE 30 day trial, you can download the PayWindow and be doing it yourself today! PayWindow has to be the easiest there is to use with our simple to follow on-line tutorials that show you everything you need to know in less than an hour. Download and try PayWindow and use the tutorials to get started and see for yourself. Paying your employees does not get any easier! Not only is the PayWindow software easy to use, it is powerful and full featured where accountants are using it for performing payroll services for their clients. If you read below you will see many of the features found in PayWindow. But the best way to see these powerful features is to download the FREE 30 day trial and start today and find out how easy it is to perform a payroll in less time than you can imagine. You can use PayWindow for FREE and then purchase it only when you decide to keep it. Read below and click on the Products page menu selection above to see more information about PayWindow. But more importantly, download the PayWindow payroll software and take control of your payroll processing today! Affordable Payroll Replacement For Sage DacEasy Payroll Users! If you are a DacEasy Payroll customer and have been notified they are closing down and looking for a new payroll then look no further. Download and try PayWindow Payroll for free. See how an affordable replacement can save you money and give you the tools you need to perform your payroll without the worry of price increases every year. As you may know, the PayWindow payroll software provides generic reports for all states and you need to move the data to the state forms. Now you can have your state forms printed on plain paper as we partnered with a company that just prints state tax forms. The software they sell will take the data from PayWindow and prepare your quarterly state tax reports. The company is DGR Software at http://www.dgrsoftware.com/zpay.htm. When contacting them be sure to tell them that you are interested in the software that supports PayWindow as that is a special version prepared for PayWindow by them. Yes processing your payroll by hand is slow and tedious work. Here is just one example of how to cut your time down to minutes instead of hours with our payroll software. In the PayWindow Payroll System, All of the above is automatic. The information is stored each time you perform a payroll. PayWindow prepares and prints the 941 form on plain paper with a few mouse clicks and you are done. So instead of the 15 plus hours the IRS tells us it takes, you only spend a few minutes of your time to print, sign and mail in the form. Pay your employees by Direct Deposit! The PayWindow software can deposit your payroll direct to your employee's bank accounts via an actual ACH NACHA formatted file created after each payroll. No more need for a 3rd party ACH processor. With this new feature, simply perform your payroll, export a true ACH data file and send it to your bank. Contact your bank to see if they have this service and save on printing checks and get the payroll to your employees faster! PayWindow an Affordable Replacement for QuickPayroll and QuickPay! Tired of the expensive annual updates to QuickPay or QuickPayroll from Intuit, the makers of QuickBooks? PayWindow is an excellent QuickPay replacement and QuickPayroll replacement. With the extensive reports in the PayWindow software you can save a bundle by using PayWindow to pay your employees and track your payroll expenses and taxes. It's easy, just use PayWindow and each month make two simple general journal entries into QuickBooks or the old Quicken if you still have never upgraded to QuickBooks. One for total payroll and one for total taxes. Or you can use the data transfer tool to make individual general journal entries for you by using the PayWindow software to QuickBooks data transfer tool. For Quicken users it is really easy. On payday, simply go into the check printing section of the Report Center and use the QIF page to export the payroll data to an Intuit Quicken QIF file that can be imported into Quicken. PayWindow to QuickBooks data transfer tool. PayWindow users who also use QuickBooks 2002 - 2018 Pro or Premiere can post transactions from PayWindow with a few clicks of the mouse. Go to our download page and download this free utility. Users of QuickBooks from Intuit, formerly Quicken, now have an alternative to use. The Easiest To Use Payroll Software You Will Ever Find! 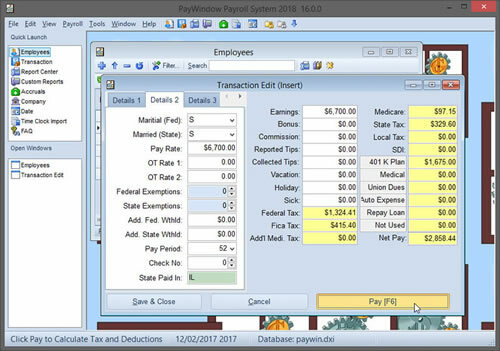 ZPAY Payroll Systems, Inc, has spent over 30 years of creating easy to use great software for small businesses and large businesses alike with the release of PayWindow 2016! After reading about PayWindow, go to the download page and download and install this great program on your computer and try it out for FREE for 30 days. Or to learn more before downloading, read our product page and go through our tutorials. PayWindow 2016 is a full featured easy to use payroll package for Windows Vista, Windows 7, Windows 8 and Windows 10. Below is a screenshot of this great program. Over 20 years of experience makes this the most user friendly and easiest to use payroll software ever. No accounting knowledge is required to be paying your employees in minutes. Easy to follow on-line tutors take you by the hand showing you exactly what to do. It's so easy to use that we sell through the Try-Before-You-Buy method of marketing known as Shareware and we want you to download and see for yourself before you buy it. Use the download link on the menu above to go to our download page. Now is the time to take control of your payroll whether you have a small business, medium or large business, PayWindow can fit your needs. Stop paying out your profits to a pay your employees when you can do it yourself for a lot less and have total control.